The Hong Kong Occupational Therapy Association invited Gail Elliot to teach DementiAbility Methods: The Montessori WayTM to Occupational Therapists (OTs) who work with individuals who have been diagnosed with dementia. Following the workshop, 65 OTs became certified in DementiAbility Methods and Gail returned in 2011 to teach a second group of OTs these same methods. The Occupational Therapists in Hong Kong have clearly demonstrated that DementiAbility Methods can improve the quality of life for the individual with dementia as well as their families and providers of care. When Gail visited Hong Kong in 2011 there was clear evidence that the OTs had learned new strategies that contributed to enhanced function and an enriched quality of life for those living with dementia. Environments were modified according to the DementiAbility Methods, and purpose and meaning were added through the use of daily agendas, purposeful activity and meaningful memory aids, based on each individual's needs, interests, skills and abilities. Congratulations to the OTs in Hong Kong for their great work and tremendous success. 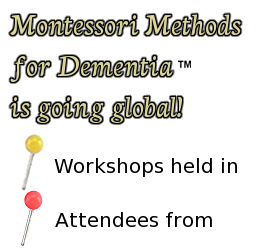 The Montessori Methods for Dementia™ book, written by Gail Elliot, has been adapted to reflect the Hong Kong experience. 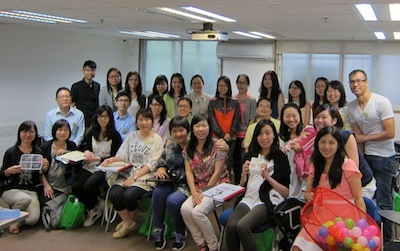 Occupational Therapists in Hong Kong, who are certified in DementiAbility Methods, contributed cases to the book based on their unique experiences. The book is an excellent resource, with culturally specific adaptations. The book is available for purchase through the Hong Kong Occupational Therapy Association. Anne Kelly has worked in the area of dementia care for ove 30 years in both community and residential settings. She currently works for AMI Australia (Association Montessori International) as a Dementia Consultant. 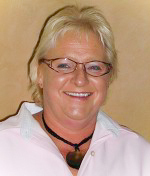 After attending a training program with Dr. Cameron Camp during one of his visits to Australia, Anne was inspired by the principles and practice of Montessori for dementia and this led to her receiving a Churchill Fellowship in 2009 to travel to Greece, Canada and USA to work with and observe the world leaders in rehabilitative therapies. It was during this prestigious Fellowship adventure that Anne met Gail Elliot. They worked together and learned from each other for three enriching weeks. Anne was pleased to write the foreword in the Australian version of Gail's book Montessori Methods for Dementia™, which is available for sale through Alzheimer's Australia Tasmania. Anne works to facilitate Montessori training throughout Australia and is mentoring organizations to change care practices and embrace a rehabilitative approach to care.ach to care. About 25 years ago, Dr. Cameron Camp made the original connection between Dr. Maria Montessori's vision, mission and principles and dementia. 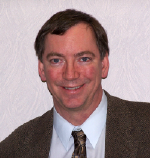 He continues to conduct research, teach, write and collaborate with experts around the world from a diversity of disciplines. Jennifer A. Brush, M.A., CCC/SLP is an international speaker and recognized speech-language pathologist known for her work in the areas of memory, swallowing, and environmental interventions for people with dementia. She has served as the Principal Investigator on applied research grants that have examined issues pertaining to HIV/AIDS dementia, hearing impairment, dining, dysphagia, and the long-term care environment. Her research and consulting in the area of environmental modifications has resulted in improved functioning for people with dementia. 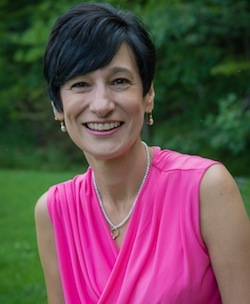 Jennifer is the co-author of four books: Creative Connections; I Care; Environment and Communication Assessment Toolkit™ (ECAT); and A Therapy Technique for Improving Memory: Spaced Retrieval. 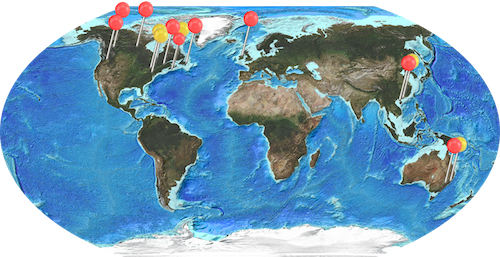 The growing interest in DementiAbility Methods has been seen coast to coast! The energy generated by each session has created a momentum that has sparked the interest of professionals from diverse disciplines, stimulating a wave of change in dementia care. DementiAbility Methods have attracted people from Victoria in the west, to Halifax in the east to as far away as Yellowknife in the north. This Canadian-born model of care has not remained within its geographical borders, attracting people from all over the world including the United States, Australia, Ireland, Hong Kong and more.